The Punjab Minister for Higher Education, Mr Khushal Bahl, has marked an inquiry into the manner of prescribing textbooks at the secondary level in government recognised schools by the education board. Amid a walkout by the Opposition, Mr Sunil Datti was elected Mayor of the holy city while Mr Surinder Singh Chhinda and Mr Om Parkash Gabbar (all from Congress) were elected Senior Deputy Mayor and Deputy Mayor here today. 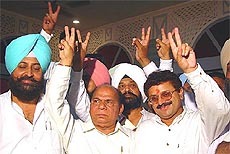 As per expectations, Mr Surinder Mahey, confidant of Punjab Local Bodies Minister Chaudhary Jagjit Singh, was elected the Mayor of the local Municipal Corporation, while Ms Anita Rani and Dr Tarsem Bahrdwaj secured the posts of Senior Deputy Mayor and Deputy Mayor, respectively, defeating their SAD-BJP opponents here today. The Budget comes at a time when the Congress government is euphoric, largely due to the PPSC job-on-cash roadshow. It also come at a time when impression was gaining currency that little else was happening in the state except the government riding high on the crest of vigilance inquiries and political vindictiveness. Is the police equipped to handle the increasing incidence of white collar crime? The answer may perhaps be a no. The reason : absence of specialised training, limited infrastructure and lack of expertise in economical and financial matters. The speed at which white collar crime is spreading to every sphere of life, the police will perhaps be left with no alternative but to go for partial privatisation. Mr G.S. Tohra, President of the SHSAD, has alleged that sensing defeat in the coming SGPC poll, like Assembly, civic and panchayat elections, Mr Parkash Singh Badal is adopting all means to delay the SGPC poll, which are to be held later this year. Ever since the detection of the multi-crore ‘job-for-money’ scam, leading to termination of services of 28 direct PCS officers, Mr Satyapal Dang, veteran CPI leader, is the only person who has openly come to their rescue. A warrant officer, appointed by the Punjab and Haryana High Court for securing the release of Sher Singh, alias Shera, an accused in the Langah corruption case, was reportedly assaulted by officials of the Punjab Vigilance Bureau today after being allegedly detained for over two hours. Mr Mangat Ram Pasla, secretary of the break away group of the CPM in Punjab, said yesterday that his faction was totally against the implementation of the report of the disinvestment commission in the state. The local police has unearthed three spurious seed packaging companies operating in the region for the past several years. According to Mr Varinder Kumar, SSP, the local police received a tip-off that some companies were selling seeds of sorgum, jowar and maize under the names of well-known companies of Andhra Pradesh by packing these in the names of these companies. Despite signs of normalcy India and Pakistan on the diplomatic front, the woes of the people living in the border villages continue to increase .The villagers complain that the Army is acquiring more land for laying of mines and raising embankments along the fencing. ABOHAR: Even before celebrating his 21st birthday, due in August this year, cadet Neeraj Jhamb has got the rare distinction of being decorated with the Maj-Gen Rajarao G.R. Rajwade Medal as the Battalion Cadet Adjutant of the National Defence Academy, Pune. The medal was awarded on May 31 at the passing out parade of the academy by Air Marshal Anil Kumar Trikha, Commandant of the NDA. Perhaps Cadet Jhamb is the first boy in this region to get the prestigious medal. Akali Dal (A) President and Lok Sabha member Simranjit Singh Mann has charged Haryana Chief Minister Om Prakash Chautala with harbouring ‘tainted’ leaders, including former ministers like Sucha Singh Langah, wanted in corruption cases. Mr Kewal Krishan Aggarwal, general secretary, DCC (I), today demanded a CBI inquiry into the matter pertaining to the construction of the multi-storey shopping complex around the historic fort located in the heart of this city recently. A campaign of the Punjab Government against corruption seems to have failed if working of the Canal Department in the district is any indication. The Kasur, branching off from the Upper Bari Doaba Canal near Sangarawan in the district, was breached by about 150 feet yesterday. Issuing notices to all truck unions in Patiala, Ludhiana, Ropar, Fatehgarh Sahib and Sangrur districts, the Secretary of Regional Transport Authorities, Patiala, has asked them to get licences from authorities concerned which was mandatory to operate. The local Sessions Court has extended the stay on the arrest of Mr Zora Singh Mann, MP, his brother and two sons to July 26. The Jalabad police had booked them under Sections 188, 379, 323, 324, 148, 149 and 506 of IPC on charges of assault and theft. Mr Roshan Lal Chouhan, Judicial Magistrate, Kharar, today extended the non-bailable warrants till June 26 against Mr Succha Singh Langah, a former PWD minister, and four others accused in a case registered by the Vigilance Department at SAS Nagar. Keeping in view the historical and religious importance of Fatehgarh Sahib, the Punjab Government would develop basic infrastructure of the district on priority basis, said Dr Harbans Lal, Forest and Food Supply Minister, Punjab, while addressing a gathering to honour the newly elected Zila Parishad and block samiti members at Khera village, 15 km from here today. The Punjab Government has decided to provide the visually challenged with easy loans and other benefits to facilitate them to start their own ventures. Speaking at a function organised by the Blind Struggle Association at Amar Ashram here, the Minister for Social Welfare, Mr Santok Singh, assured that his ministry will soon formulate a plan to provide funds of Rs 50,000 to those visually challenged persons who wish to start their own work. Eight persons were killed in accidents in the subdivision and adjoining areas of Sriganganagar during the past 24 hours. An ambulance carrying the body of Atma Singh, granthi of Gurdwara Singh Sabha, Sri Karanpur, collided head on with a truck near Shergarh village on the Hanumangarh road yesterday. Mr A.S. Kathuria, Special Judge, Ropar, today extended the judicial remand of Ravinder Pal Singh Sidhu till June 22 in the PPSC recruitment scam. Sidhu was produced in the court of Special Judge after the expiry of his earlier judicial remand today. The Ropar Special Judge, Mr A.S. Kathuria, today issued notice to the state government for June 18 on the interim bail application of Jagman Singh, a right hand man of suspended Chairman of the Punjab Public Service Commission Ravinder Pal Singh Sidhu and an alleged accused in the PPSC recruitment scam. Mr Jaswant Singh Mann, founder Secretary-General of the World Sikh Council, said today that the SAD needed to the purged of the “corrupt, tainted and undesirable” elements so that the party could be reorganised on the noble traditions envisaged by its founders in 1920. Even as campaign launched to get LIG flats here evicted from illegal occupants by officials of the Punjab Urban Development Authority (PUDA) continued today, some of those whose belongings were thrown out in the open alleged that the campaign was biased. Sat Paul (49), president of gaushalla and the local Mandir Committee, his son-in-law Mohinder Paul (22) and partner Meshi (22), alias Kala, all local residents, died on the spot today when the car in which they were travelling dashed against a roadside tree. Daljit Singh (12) a student of class VII, was killed on the spot and Vishal Kumar (8) injured when a tipper, loaded with sand, allegedly hit their bicycle near Maharaja Ranjit Singh Bagh here this afternoon. The Punjab Pensioners Welfare Association has threatened to sit on a dharna if their demands are not accepted by the state government. During a meeting held at Central Library hall here today, the vice-president of the association, Mr Sat Pal Rahi, said the Congress government must fulfil its commitments to the pensioners. Two local residents, Gurdeep Singh and Mandeep Singh, have developed in indigenous ‘insect catcher’, which they claim, if manufactured on a large scale, will solve the problem of American bollworm which destroys the cotton crop every year. The police has arrested 12 persons for allegedly trying to possess a residential plot in this city illegally by threatening its owner on the night of June 13. In another case, Makhan Singh, a proclaimed offender (PO) of Barnala police, who had been cheating people on the pretext of sending them abroad, was arrested yesterday. In a case related to a dowry death, the Additional Sessions Judge, Mr G.K Dhir, today sentenced five persons, including the husband and mother-in-law of the deceased, Anju Rani, a resident of Patran, to seven years’ imprisonment and imposed a fine of Rs 5,000 each on the guilty. The police has unearthed a multi-crore scam involving supply of adulterated tar to government departments and arrested two persons, including a chemical engineer. Mr B.K. Uppal, SSP, Gurdaspur, told mediapersons here today that the police raided a godown at Sujanpur and seized two trucks laden with barrels containing tar. A 20-year-old girl, a resident of Gulabgarh Colony, was stripped and molested allegedly by the paramour of her former sister-in-law and an accomplice. According to sources, the victim was alone at home when her sister-in-law came there along with two men. Biram Rai, who was posing as an income tax inspector, was arrested by the police today. He had been making phone calls to Mr Pawan Kumar Patwari of Shutrana for the past 10 days saying that some persons of Patran had complained to the Income Tax authorities against the latter and to hush up the matter he should meet him at the Bhakra bridge here. Three policemen were injured seriously when a motor cycle-borne persons opened fire at a police party at Azizpur, 20 km from here, yesterday. Talking to mediapersons here today, Mr B.K. Uppal, SSP, Gurdaspur, said on receiving information about an incident of chain snatching, the police laid a naka at Azizpur on Friday. The Punjab and Chandigarh College Teachers Union (PCCTU) has decided to observe ‘black day’ on June 24 at Punjabi University here and Panjab University, Chandigarh, to protest against the new pension policy formulated by the state government for government-aided colleges.